Hello! Welcome to Day 3 of Taylored Expressions November Sneak Peeks! Today we are featuring Certified Mail Art, Chalkboard Elements 2, Falling for You and coordinating dies, Discover Your Wings plus coordinating Dies: In Flight and Flowers. We are having a Facebook preview party tonight @ 6 PM PST. Hope you can join along here! All products will be released tomorrow, Thursday, November 7, @ 7 AM PST. I have 2 cards to show you today. The first one uses the previously released set, Discover Your Wings. It has always been one of my favorite TE stamps. It is full of flowers and winged creatures (butterflies, dragonfly), so what is not to love? Well, I love it even more now that there are coordinating dies available for it! 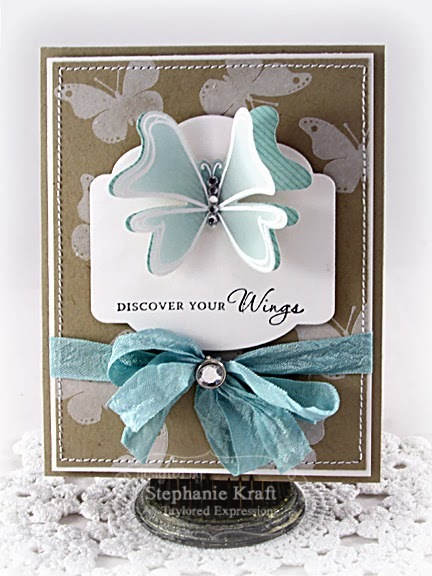 I've use Discover Your Wings - In Flight to die cut the butterfly, which is layered. The top was stamped and embossed onto vellum and the bottom is patterned paper. I also created my background paper by randomly stamping a smaller butterfly with white ink onto Kraft cardstock. The larger butterfly is popped onto a Label Stacklets 7 die cut. 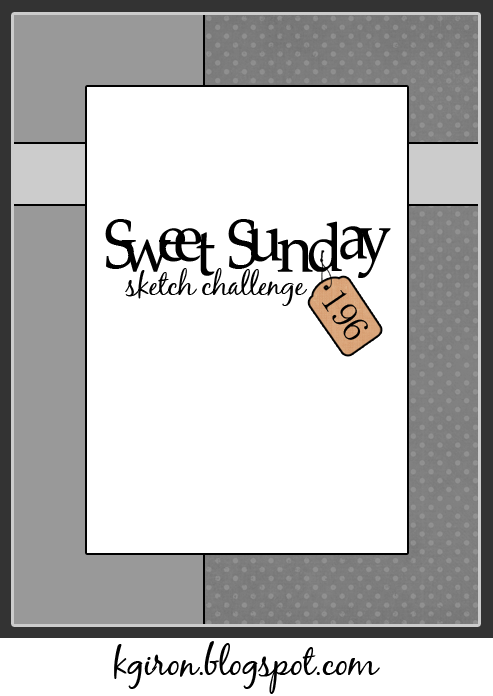 My next card uses Chalkboard Elements 2, a follow up to Chalkboard Elements. 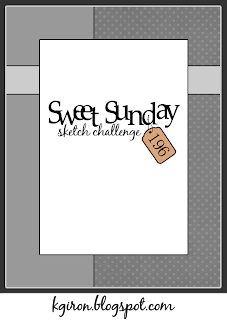 The sets can be used solo or you can mix and match and create your own unique sentiments! All of the sentiments and elements that I used are from the new set. 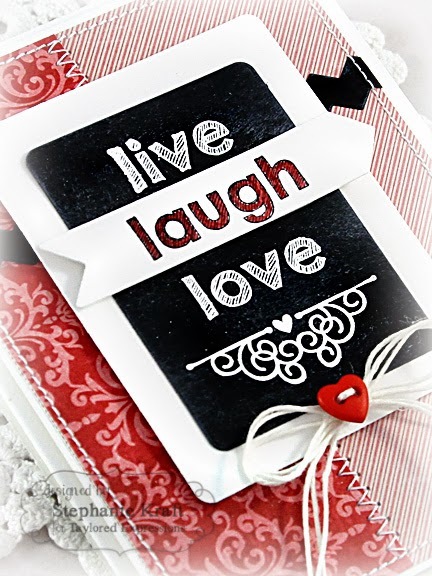 Live, Love and the flourish were embossed onto Chalkstock, then the chalkboard was "dirtied" a bit with white ink. 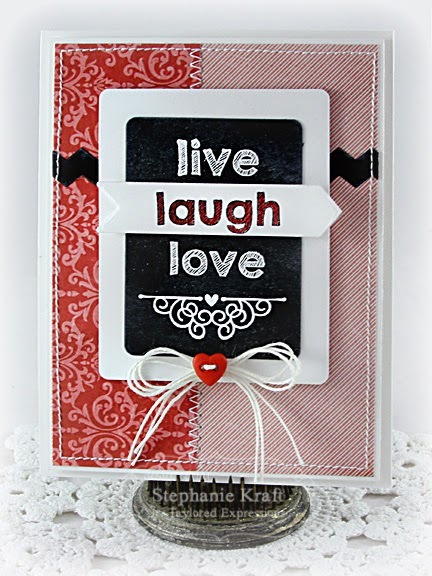 Laugh was stamped onto Choice White cardstock, die cut with one of the Label It dies and popped up. It was also colored in with a Lipstick Spica Glitter pen, so it sparkles in real life! Accessories: Taylored Dies: Discover Your Wings – In Flight, Labels Stacklets 7 (TE); White embossing powder, Rhinestones, Seam binding, Rhinestone brad, Foam tape, Thread, Sewing machine. Accessories: Taylored Dies: Chevron Borders, Label It (TE); Lipstick spica pen, White embossing powder, Hemp cord, Button, Foam tape, Thread, Sewing machine. Meeep!! Love that butterfly!! Great work with the vellum! So very pretty Stephanie! Love that beautiful butterfly! 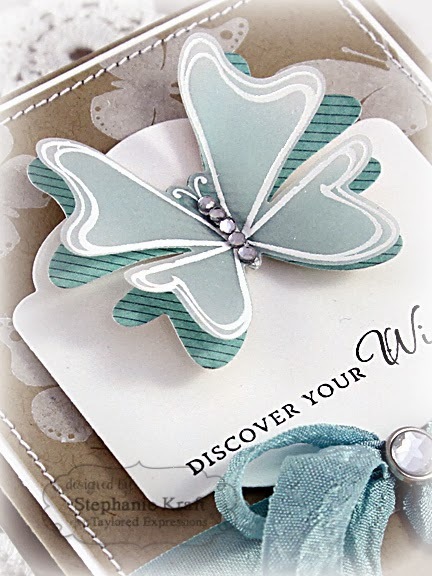 Oh my...I sooo love your vellum butterfly and the gorgeous color combo you used!!! Your chalkboard sentiment with the little red heart button is super cute, too!!! !